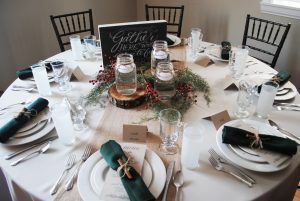 Last year, our Event Specialist collaborated to design two tablescapes for Thanksgiving. We had overwhelmingly positive reviews, so we decided to share again this year! Both looks are easy to duplicate and sure to be a hit at your Thanksgiving or Holiday party! The first design is a modern design with rustic elements. 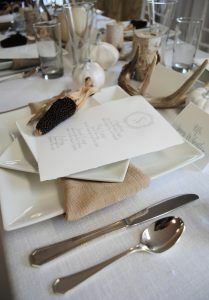 We love the textured panama with the sleek Elexa flatware paired with the juxtaposed square china. If you don’t have time to find the antlers or don’t want to spend the money, you can easily skip them and add more pumpkins to achieve the same look. 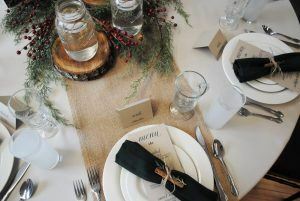 The second design is more rustic with a holiday feel. 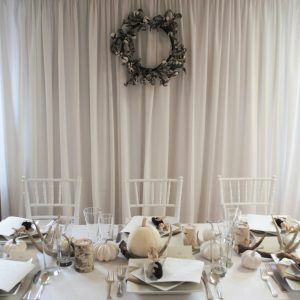 This look will work for Thanksgiving or Christmas depending on the centerpiece. 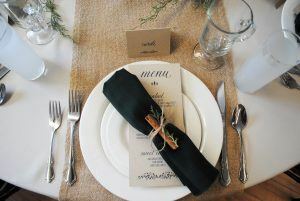 Angela, the designer, chose simple twine and a cinnamon stick to “spice” up the forest poly napkin. 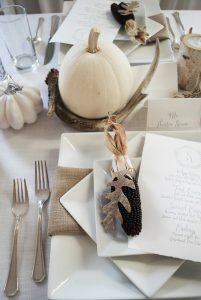 We love using cinnamon sticks in Fall design – it’s easy to find, no work necessary and it adds a delicious scent to your design. This table design is not only easy to duplicate, it’s easy on the wallet as well! Cinnamon sticks, twine, a few twigs and berries, and a couple of mason jars is inexpensive and barely DIY for those of you don’t have time for arts & crafts like me.